It’s been a while since I have started with standing meditation practice Zhan Zhuang and I was eager to go deeper with it. The expansion of time practicing didn’t bring the results I was anticipating, so I searched a bit further and I found Yiquan. Here in these few posts about Yiquan I present the practice that was developed and simplified from the original practice by very known Xingyiquan master Wang Xiang Zhai, who lived in the first half of 20th century in China. It was simplified and used for martial arts training, as well as the practice for developing inner strength and building up individual’s Qi level, which can be used for different purposes including energy healing. This was very important for me, since as a healer sometimes I would get over myself and get drained from time to time. Don’t get me wrong, not that I don’t enjoy the work and supporting the client in his/her process, but sometimes you go a bit over the limits and you need to recharge yourself. Qigong is the best tool for that. 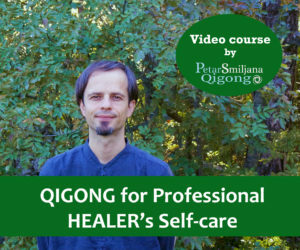 This Qigong set just makes miracles! You are standing in a normal stance. 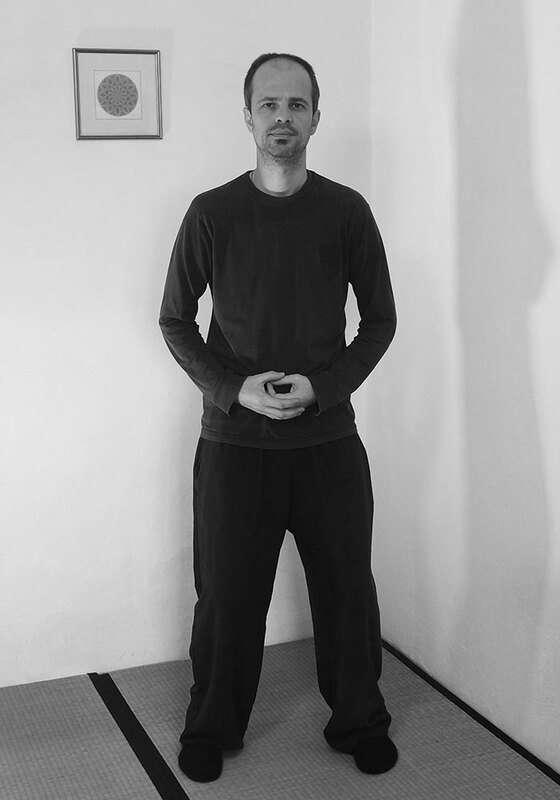 If you don’t know what is a normal stance, please see our PetarSmiljana Qigong posts on petarsmi.com website or watch our videos on our YouTube Channel »petarsmiljana qigong« about this topic. But for now: Your stance is a shoulder width wide. Your knees are softened and lightly bent. As you know, in this set you are holding your arms in different positions for extended periods of time. You should suspend your arms in the manner of extending them outward. How is this done? You make a light oval behind your back in the level of shoulder blades and as you do that, you should open your shoulder blades outward. This will automatically give more space to your arms and extend them outward. Expansion will get its meaning when you make an oval shape with your arms, while being in one of the positions. At the same time you will need to relax your shoulders completely to be able to hold your arms in a static position for extended period of time. This is so called dynamic stillness in one other art that I practice, Craniosacral therapy. You will feel opening of your arms from your shoulders, shoulder blades, armpits and the joints that follow toward the tips of fingers. I usually say »put your weight under or below your arms, so your upper muscles can relax«. How? Bring your attention under your armpits. Suspend and relax your shoulders. People often tend to pull their shoulders up towards their head and neck, making impossible to stand in such position and build up the energy, since such position only blocks the energy flow. It also blocks nerves and blood vessels. Which can result in high blood pressure and vertigo, pour lymph drainage of brain etc. Breathe normally and as relaxed as you can. Breathe with no more than 70 percent of your capacity. Try to breathe with your lower Dantien or lower abdomen However if you are not able yet, do it as relaxed and deep as you can in your present condition. Once you are in a posture and your arms and whole body is relaxed, you can start to feel how connected is your body. From within outwards the movement of expansion will come. While you breathe your lungs, diaphragm and abdomen will expand and move your whole body and its parts. Your spine will lengthen, your back will expand in oval shape, your head sutures will open and your brain will resonate in slower rhythms. Your arms will lengthen as well as your legs. 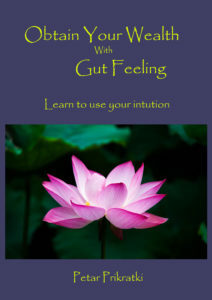 Internal organs will start to pulsate in their own rhythms as they will get more space and consequently more Qi. Your nerves will relax even more and your tendons and fascia will create a sense of unified space within you. This feeling is very important for all healers, as well as healing processes and all other energy work, even the internal martial arts, if done properly. In the future this process might go on beyond the physical level into the field and into the other energy bodies, that you were not aware you had before. Big potential, if you ask me! Only from a standing practice. But it takes time to get there! Don’t think you are there after you’ve been doing it for couple of weeks, however many things might happen even after two weeks of daily practice. 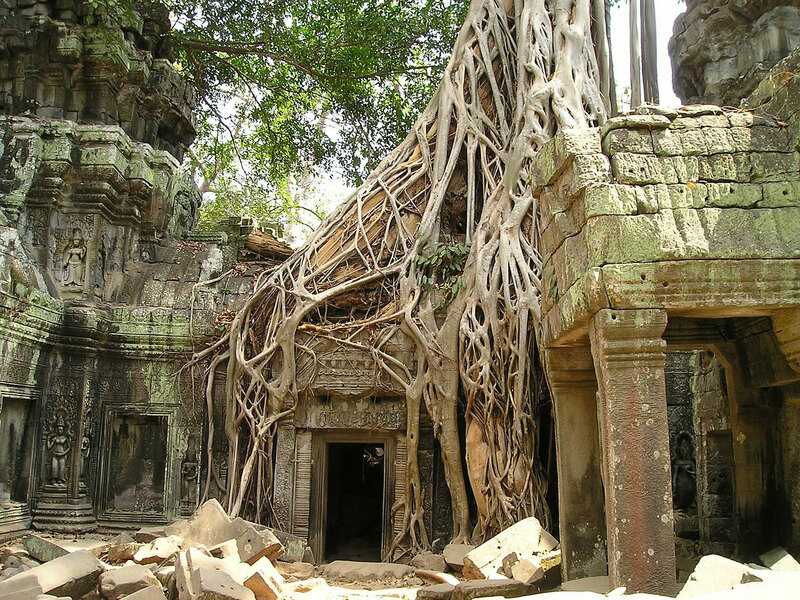 To make this practice correctly, we need to lead the energy downwards toward our roots. In the ground. How is this done? Simply, lead the Qi with your attention while you inhale downward toward your Yongquan points on your soles. Here you can stop, however, if you want to activate the Earth’s Qi, you should go beyond your physical boundaries into the ground. Your roots need to be deep and wide in order for you to be stable for martial applications, healing sessions or just demanding daily tasks. Your roots should be at the end of training of same length as your height! Another way of leading the Qi downward is connecting three areas on the back side of the body. These three areas will connect you with Yang aspect or yang energy meridians and will start the flow of energy in natural downward flow. Yang energy will naturally sink, however when it is consumed and obstructed with our mental activities it tends to get stagnant. We can, with Qigong practice and proper mindset, get this energy flowing back again. Three areas that we should connect in order to release blockages and start the energy flow are shoulder blades, your buttocks and heels. These three areas should be relaxed and mentally connected in your mind while you are standing. This will result in abundant stream of energy that will feel like internal shower, bringing the light and life down, to the parts that were missing it for a long time. The third way to lead the energy downward is connecting your tail bone and your feet. This will connect the major reservoir of Yang energy in your body which is Du Mai extraordinary meridian with the most Yin point Yongquan points Ki-1. It will result in the energy flow similar to that described in the previous paragraph. I recommend you to try all three if any of them suits you, use it. I use them all, since all three have worked for me. Remember, it takes time to ground our energy and you should practice it daily! This mindset and practice will in time activate the infinite reservoir of Earth’s Qi available to you, for any purpose you choose. In past this part of training took about 80 percent of time to reach that level, when the Earth’s Qi was activated and started to move back upwards, feeding the tissues and organs of body, filling the energy reservoirs of body and establishing connection and equilibrium. Truly blissful moment. When this happens you will know it as the energy will move in circular or coiling motion upwards, and embracing your etheric body, gently touching also emotional levels of your being.